I'm not going to say I love vacuuming, because I'm not sure if anyone loves chores. But out of all the chores and tidying up that needs to be done, vacuuming is definitely my favorite. 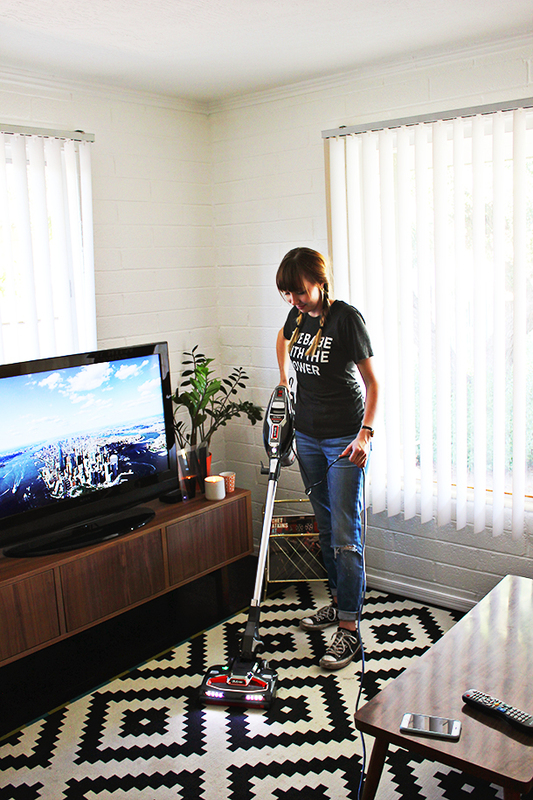 I've always picked vacuuming as my weekly chore, even when growing up. 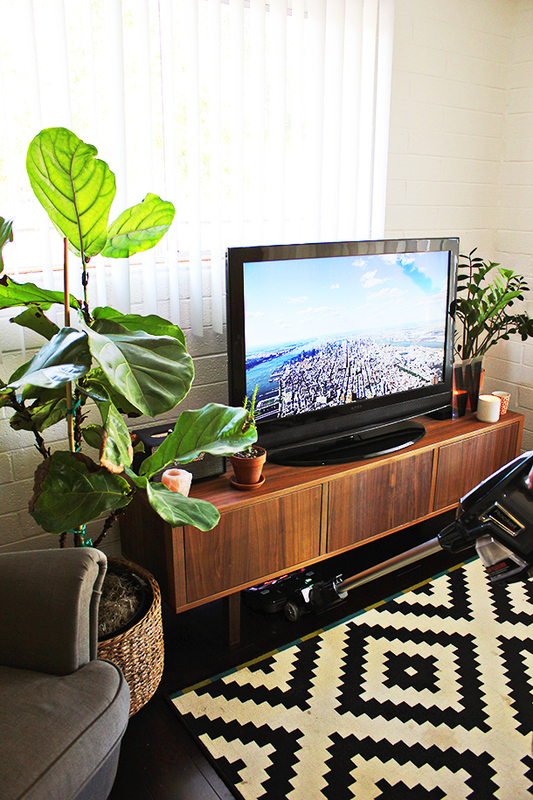 Other than tidying up, I think vacuuming is the best thing you can do to get your house ready for company. It's always my go-to task when getting ready for people to come over. It instantly makes the room cleaner and the space feel more refreshed. Doing this with a vacuum that's not great can makes this process super frustrating. 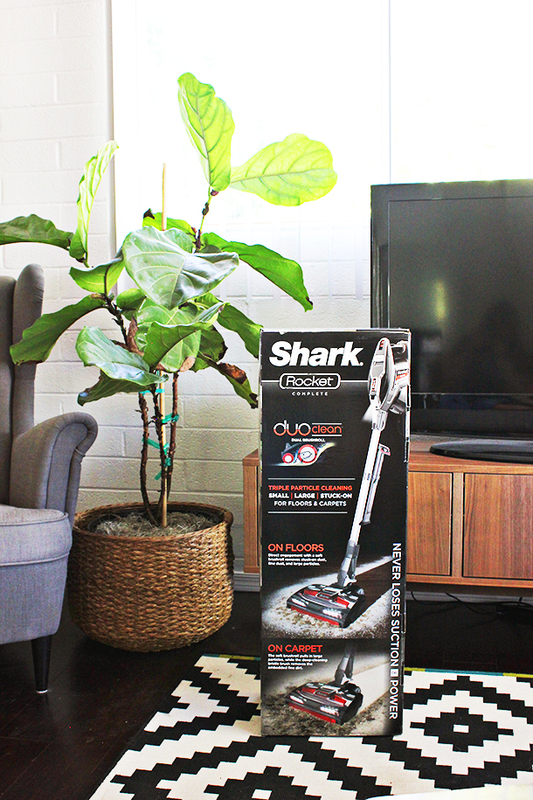 I just got the new Shark Rocket Ultra-Light DuoClean and it's perfect for quick and easy clean ups! Well, my house is so small, it's really great for the whole place! For being a small vacuum, this thing really has power. Our house is about 700 square feet and we are able to vacuum the whole place using one outlet and without needing to empty the canister! I really love this vacuum for three reasons. 1. The DuoClean brushes are perfect for hardwood! When we picked out our flooring, everyone said we would regret the dark stain, because it shows dirt and dog hair so easily. Trust me, it does. This vacuum is perfect for keeping it clean. It has the traditional brush that most vacuums have and it has a second brush that makes all the difference. The second brush is a really soft and fine brush (it almost feels like a microfiber blanket) that catches are the really fine dust and dirt particles as well as dog hair. These DuoClean brushes are really great for any type of hard floors! 2. It's sustainable. This vacuum doesn't use bags, which I love. We aren't wasting any bags in the process and I think it's fun/gross/entertaining to see how much dirt I can collect in the canister. Not only does this vacuum not have a bag, but the filters are washable and reusable as well! So what the vacuum comes with is all I need and there's no extra waste. 3. It can easily reach under all of my furniture. Since the motor of the vacuum is at the handle, the base is really small. I can easily get under the media cabinet, couch, bed, and dresser without needing to use any attachments. I can just keep vacuuming as normal and reach all those tricky spaces. This vacuum also comes with a mounting bracket to hang it on the wall! It's great for saving space in the closet. One thing to be mindful of is that it is top heavy. Before walking away from the vacuum, you need to remove the top part and rest it on the base of the wand. It will fall over otherwise. Luckily, it's really easy to do. I think this is the perfect vacuum for anyone living in an apartment or smaller home. It has a long cord and can tackle the whole house. It's still perfect for someone living in a larger home, because it can reach places that large vacuums can't and has great attachments for cleaning things like the fan blades and around the windows. It's light-weight too, which is nice if you need to move it up and down stairs. P.S. Does anyone else like seeing how much stuff they can collect in the canister?! I received this vacuum as a sponsored post, however all words and options are my own.